Premier Paving in Co Tipperary has grown over the past quarter of a century to become Ireland’s leading hardscapes contractors. Company’s Office Manager Magdalena Kaput (Mags), was able to fill Building Ireland in on a firm which is presently thriving. It’s hard to see busier times ahead for Premier Paving than its presently packed schedule, but the trend over the past 18 months or so suggest that business is set to get even better down in Thurles. 2017 saw the company “very successful” with regards to its domestic sales, according to Mags Kaput, who has been the Office Administrator at the family-run business for two years now. A Polish native, Mags has been living and working in Ireland for the past 14 years now and was delighted to become a proud member of the team at Premier Paving some 24 months ago. Building Ireland caught up with her recently to discuss the details of a company which has become known for offering top quality at a fair price. “The company itself is established 25 years this year and is based in Blackcastle, Two-Mile-Borris, Thurles, Co Tipperary,” Mags explained. “Gerard Woodlock is the Managing Director and it’s very much a family business with his wife, sister-in-law and two brothers also involved. “Altogether there is 16 full-time staff and after that we have ability to up our staff, so there could be more than 100 working here when you take that into consideration. We are ready to get the job over season on time, every time. Over the years, Premier Paving has grown to the point where it now prides itself in being specialists in paving solutions for both large commercial clients and domestic clients in both Ireland and the UK. The company has grown its portfolio so impressively that it now includes Resin Bound Surfaces, all paving accessories, artificial grass, rubber mats and chippings, Climbing frames, Naturals stone products, porcelain flags, bespoke paving, prophy setts, from multiple suppliers like Stonepave, Kilsaran Home, Acheson and Glover, Barleystone, Kilkenny Limestone, Ronadeck, SIG, Long Rake Spar and many, many more. Premier Paving also has an office in Dublin to accompany its headquarters in Thurles to better serve its national client base. 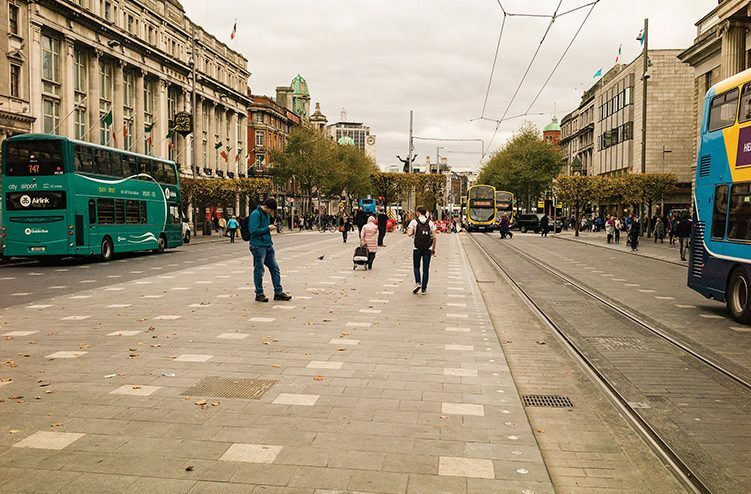 “We specialise in installation in all types of natural stone, which is a big part of our business as we do a lot of Public Realm Projects both in Ireland and UK. “We cover nationwide, specialising in commercial paving and we also supply and install concrete brick, clay brick and precast hard landscaping materials. We mainly do the labour, but we supply and fit also on request. In Blackcastle, Two-Mile-Borris, Thurles, Co Tipperary E41 PY60, they have a full product portfolio at their display centre, which is located a short distance from Thurles town and just approximately one minute from exit 5 of the M8 motorway. The centre offers a complete range of paving solutions that is designed to help the requirements of both domestic and commercial clients. In more recent years, Premier Paving has evolved into the world of Cladding and Resin Bound Surfaces which led to the company developing its very own Cladding and Resin division. Numerous cladding and resin packages, which range from bespoke to landscape feature walls to housing facades or driveways have been completed by the business. Premier Paving also design, supply and fit Gabion walls and offering such a wide range of services is part of the reason why so many different clients tend to choose them first. ? Office manager Magdalena Kaput explained that business now couldn’t be much better for the firm. “We’re very busy with a lot of contractors at the minute,” she said. “We’ve had some very big projects with Sisk – last year we worked on the Pairc Ui Chaoimh with them and it was a great project to be involved in. “We also work closely with O’Brien’s Landscaping, Duggan Brothers, John Craddock, Stewart, JJ Rhatigan, and John Paul Construction; so we’ve been kept very busy. Domestic Sales last year were very successful as well. Premier Paving’s work at Pairc Ui Chaoimh, which is home to Cork GAA, included the supply and installation of 2,000m2 granite effect paving flags; 2,000m2 grasscrete, complete with topsoil and seeding; installation. Work on the project was completed in July of last year. As for some of the company’s current projects, the Curragh Racecourse stands out as the highest profile one for 2018 thus far and the hope is to continue the trend of securing projects of such calibre year in, year out. “The biggest project we have on-going at the minute is the Curragh Racecourse project and it’s for Sisk,” said Mags. Overall the picture continues to be very positive for Premier Paving as the company moves towards the second half of 2018. Needless to say, it’s a business that is not going to be beaten on quality, at a price that clients really can afford. They remain experts in all types paving, driveways, resin bound gravel surfaces, as well as general paving and Mags feels such qualities are a huge part of the reason why clients come to them first ahead of other competitors in the same industry. Getting the tendering out quickly to clients doesn’t do any harm either, according to the Office Manager. “I really do think that we try our best to send out our prices out fast. The tendering process with us is quick,” she said. So if you’re looking for a reputable company which specialises in the installation of all types of natural stone, clay brick, concrete and precast hard landscaping materials, be sure to look no further than Premier Paving in Two-Mile-Borris.